There can be over 40 categories of cabins. Which one to choose? How to choose the right cruise ship cabin? The room you pick on your cruise ship is called a cabin, or, if you are willing to pay a premium, a state room. This is similar to a hotel room but it is typically much smaller. Selecting your cabin can be fun but it can also be a challenge, especially if you don't know anything about cruises. Different cabins fall into different categories. Some cruise lines have up to 40 types of cabins per ship. Before you start to get overwhelmed, keep in mind that no matter how many types of cabins are presented there are generally only four types of cabins on any type of cruise vessel. Interior: this is the smallest sized room and it will be inside the ship with no window looking out. These cabins are also the cheapest. Oceanview: this is a room that comes with a window or a round window call a porthole which gives you a view to the outside. The size is typically the same as an inside cabin but sometimes slightly larger. Balcony: these rooms tend to be slightly larger, with a small veranda or French balcony attached where you can take in a breeze and the view without leaving the room. In the past, these rooms were much more expensive, but as cruise lines have been adding more balcony rooms to many ships in recent refurbishments, they are becoming more affordable. Suite: this is a much larger cabin, typically with a separate living area and sleeping area. Much the same as a hotel, you will find that there are a wide variety of extra amenities and perks available to you when you book a suite. That said, of these four basic types each cruise will have many permutations. Some examples include the location on the boat itself, the size, the view you are afforded, the price, and the amenities. In addition to knowing your options, you also want to ask yourself whether you tend to get seasick. If so, you might want to get a room which has a private balcony so that you can immediately step outside and get some fresh air. The same is true of someone who might generally feel claustrophobic. You might prefer spending extra money to get a peaceful private balcony so you don't have to hang around a crowded pool area. In some cases you might want to pay extra for a larger sized room, or you might prefer the cheapest room possible so that you can simply spend a limited number of hours in bed while taking advantage of all the other features included in your price. The location of your room might matter to you if you have a small child and you need to make sure that they get sleep without being interrupted, if you don't want to be kept up all night, if you prefer a view, or if you get seasick. If you are someone who tends to get seasick, your cabin location is probably the most important thing. The lower and more central you are, the less rolling and swaying you will feel. 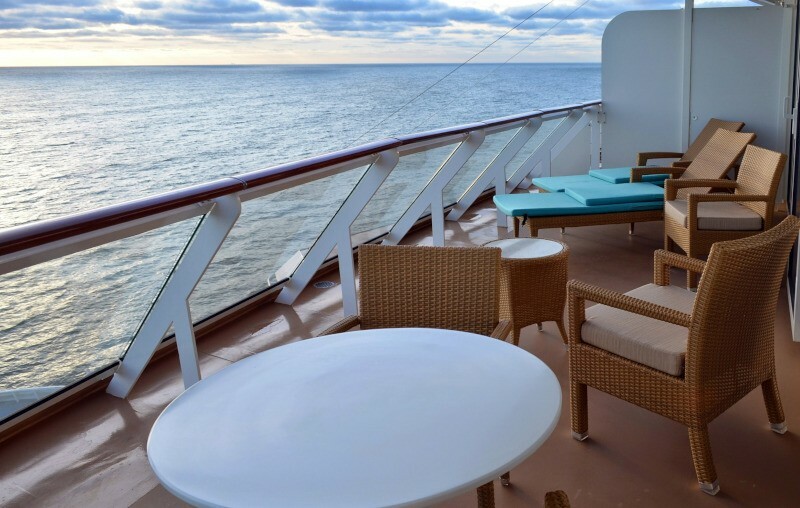 If you want a room with a balcony, choose the lowest level and the one that is most mid-ship. The higher up you are and the closer you are to the front or the back of the ship, the more rocking and rolling you will feel. Certain travelers want their cabin to be close to a specific part of the ship or really far away. If you want to enjoy sunlight most of the time, pick an upper deck location which is close to the pool. For travellers who want to enjoy partying you might want to pick a location closest to the entertainment areas of the ship. If you have concerns about mobility, choosing a state room close to the elevators is ideal. Many cruise lines will place their most expensive cabins on the highest deck often right below the pool deck. This is generally because you have the biggest windows and balconies which means you have the most beautiful views. However, before you splurge on the nicest cabin available, understand that the pool deck is generally where the most amount of noise is generated. You will hear people screaming, laughing, and you will never be able to get away from the noise of chairs scraping across the ground. If you are worried about noise, it is best to choose a cabin that is above and below other cabins. One pitfall here is that the service areas might be located above your room, the bars could be next to your room, or laundry services could be across from your room. In these situations you are in close proximity to things like noise. If you pick a room that is located at the back of the ship and is low you will probably hear a lot of engine noise and vibrations. If you pick one that is at the front of the ship and low you will hear the same type of noise but from the thrusters. So you just have to choose which things you are willing to give up. With the advent of oversized ships, now you can book a cabin in a variety of shapes and sizes. You can get more than just a tiny box. You can book a suite or a loft. The balconies you get also range from something really small that only lets two people stand to something with a wraparound deck with outdoor tables, and even hot tubs in some cases. On most cruise lines the interior and oceanview cabins are typically the same size, with the main difference being that you get a window or a porthole to let in natural light. The cabin options that have balconies are, again, roughly the same size as standard interior or oceanview cabins, but they have a larger outdoor space. Your basic cabin is called a standard cabin unless there is a specific functional difference, like family size, or improved accessibility design. If you choose a mini suite or anything larger, you will enjoy bigger spaces compared to the interior or oceanview basic cabins. Most travelers have to make a decision based on price. If money were no object everyone would pick the large suite. But for certain travelers it can be difficult to decide whether it is worth the upgrade from a standard window to a balcony. That said, ask yourself if you really need a balcony. If you want to spend a lot of your time outdoors in the public areas like the lounges, the restaurants, or onshore, you might be perfectly happy having a standard size cabin without a private outdoor space. But if you want to avoid the crowds of people and you want to lounge quietly or eat your meals outside in seclusion, make sure you invest in the balcony. Of course, all of this is superseded by the fact that your itinerary matters. If you are going to take a cheaper cruise in October to the Caribbean, bad weather could seriously downplay the importance of having a balcony. You certainly wouldn't want to spend a great deal of time outside dining if it's only going to rain. Pay special attention to the setup of each cabin because not every cabin is created equal. Some cruise lines have larger standard rooms for families featuring divided sleeping and living areas, though these are not true suites. Some boast separate rooms for the shower and toilet, with the sink located in the main cabin. Often the cabins located at the front or back of the ship will have a different layout than those along the middle of the ship. Every cabin has basic amenities like turndown services, toiletries in the bathroom, and air conditioning. But certain categories might come with extra perks. There are specific suites that have a variety of benefits like priority boarding or a minibar in the room. Some cabins provide things like fancier showerheads and yoga mats. If these are incredibly important to you, then obviously paying a premium for them is well worth it. Other benefits that you might find included in your cabin are things like concierge services, which can help you make reservations for shows, book excursions when you get to port, or make requests. In some cases having the concierge service gives you access to a private lounge. Other cruise lines offer butlers. This service is incredibly expensive but if you can afford it can be well worth it. The butlers can do things like serve your meals in your cabin one course at a time. They can refill the minibar to match your specifications, even get you room service from alternative restaurants. Other amenities might include walk-in closets, dining room tables large enough for a big family, priority dinner reservations, whirlpool bathtubs, extra bath products, in-suite coffee and minibars, and more. Naturally the decision as to which room you want to purchase is based on price for most people, but if the difference is minimal, you should take into consideration things like location, size, and extra amenities.